Coach Ina has specially developed tools to help you write the book of your life, and get it out -- to friends, family, and the world if you like! 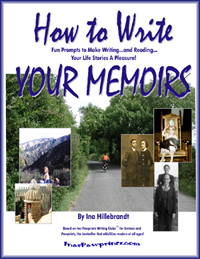 The stimulating step-by-step guide to how to write your memoirs. Click to see Ina and stellar students in videos showcasing their stories! Live classes: available on an ongoing basis in the Los Angeles area, and by arrangement, anywhere on the globe. Contact Ina to learn more.